2018 winner Mitch Guthrie Jr. set the fastest qualifying time on Saturday in his new Polaris RZR XP Turbo S Velocity, ahead of Midwest short course racer Kyle Chaney by only 2/10ths of a second. On race day, when the green flag dropped, Phil Blurton passed both Guthrie and Chaney in his turbocharged Can-Am Maverick X3 to take the physical lead in the 91-mile desert loop. When the race moved to the infamous Hammers rock crawling canyons though, everything changed. 22-year-old Mitch Guthrie Jr. has literally grown up in Johnson Valley, where his father has won the King of the Hammers UTV race six times. “We’ve been doing a lot of pre-running this week. The rocks are where it counts, and we had some great lines through them. We never even had to winch,” Guthrie revealed at the finish line. The 160-mile course started with a 91-mile desert loop that mixed high speed lakebeds with tight, twisty ridgelines that challenged man and machine. 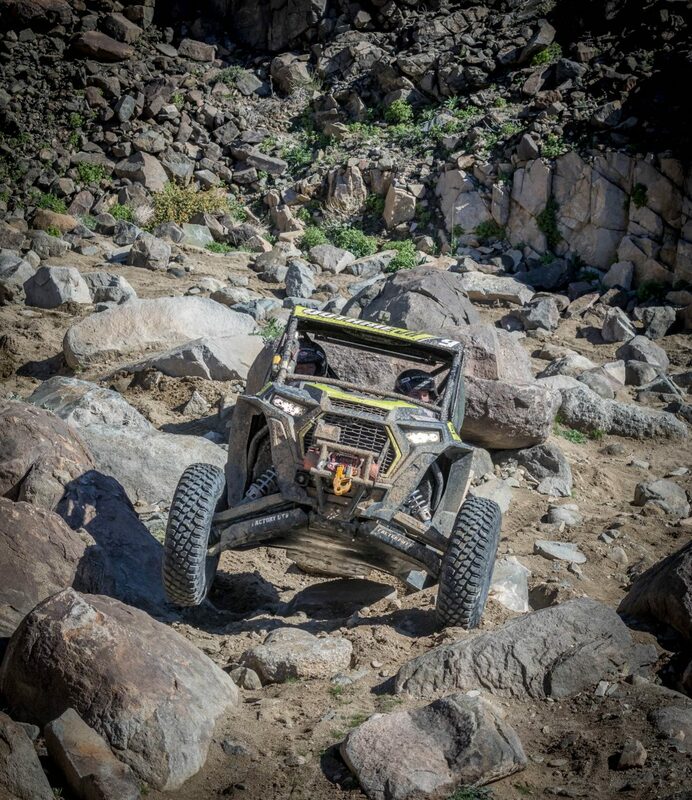 From there the difficulty ratcheted up as the competitors had to traverse Outer Limits and Spooners as part of the rock loop; trails that challenge even Ultra4 cars with 40-inch tires and V-8 engines. Menzies, who has limited exposure to rock crawling, surprised everyone with a seventh-place finish in his first King of the Hammers race. “Friday was my first time driving in the rocks, and today was my second day in the rocks. I’m used to going 140 mph, not 3 mph. The rocks are technical, and it’s very challenging and you have to be smart.” Bryce Menzies will be on the lakebed all week long, racing in the Toyo Tires Desert Invitational presented by Monster Energy on Thursday, February 7th.